You must determine your lawful basis before you begin processing, and you should document it. Take care to get it right first time – you should not swap to a different lawful basis at a later date without good reason. If your purposes change, you may be able to continue processing under the original lawful basis if your new purpose is compatible with your initial purpose (unless your original lawful basis was consent). If you are processing special category data you need to identify both a lawful basis for general processing and an additional condition for processing this type of data. If you are processing criminal conviction data or data about offences you need to identify both a lawful basis for general processing and an additional condition for processing this type of data. The requirement to have a lawful basis in order to process personal data is not new. It replaces and mirrors the previous requirement to satisfy one of the ‘conditions for processing’ under the Data Protection Act 1998 (the 1998 Act). However, the GDPR places more emphasis on being accountable for and transparent about your lawful basis for processing. The six lawful bases for processing are broadly similar to the old conditions for processing, although there are some differences. You now need to review your existing processing, identify the most appropriate lawful basis, and check that it applies. In many cases it is likely to be the same as your existing condition for processing. The biggest change is for public authorities, who now need to consider the new ‘public task’ basis first for most of their processing, and have more limited scope to rely on consent or legitimate interests. You can choose a new lawful basis if you find that your old condition for processing is no longer appropriate under the GDPR, or decide that a different basis is more appropriate. You should try to get this right first time. Once the GDPR is in effect, it will be much harder to swap between lawful bases at will if you find that your original basis was invalid. You will be in breach of the GDPR if you did not clearly identify the appropriate lawful basis (or bases, if more than one applies) from the start. The GDPR brings in new accountability and transparency requirements. You should therefore make sure you clearly document your lawful basis so that you can demonstrate your compliance in line with Articles 5(2) and 24. You must now inform people upfront about your lawful basis for processing their personal data. You need therefore to communicate this information to individuals by 25 May 2018, and ensure that you include it in all future privacy notices. Why is the lawful basis for processing important? The first principle requires that you process all personal data lawfully, fairly and in a transparent manner. Processing is only lawful if you have a lawful basis under Article 6. And to comply with the accountability principle in Article 5(2), you must be able to demonstrate that a lawful basis applies. If no lawful basis applies to your processing, your processing will be unlawful and in breach of the first principle. Individuals also have the right to erase personal data which has been processed unlawfully. The individual’s right to be informed under Article 13 and 14 requires you to provide people with information about your lawful basis for processing. This means you need to include these details in your privacy notice. However, an individual always has the right to object to processing for the purposes of direct marketing, whatever lawful basis applies. 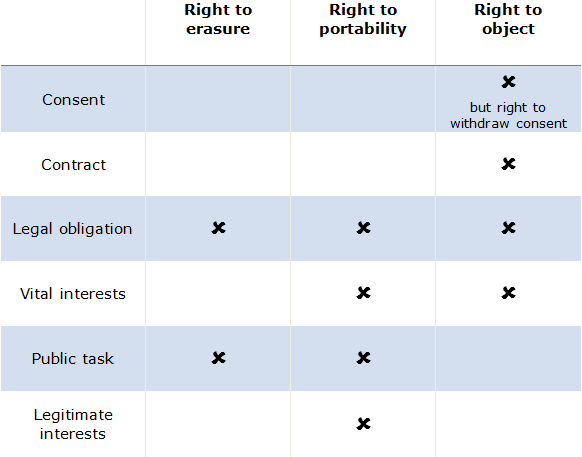 The remaining rights are not always absolute, and there are other rights which may be affected in other ways. For example, your lawful basis may affect how provisions relating to automated decisions and profiling apply, and if you are relying on legitimate interests you need more detail in your privacy notice to comply with the right to be informed. Please read the section of this Guide on individuals’ rights for full details. For more detail on each lawful basis, read the relevant page of this guide. Many of the lawful bases for processing depend on the processing being “necessary”. This does not mean that processing always has to be essential. However, it must be a targeted and proportionate way of achieving the purpose. The lawful basis will not apply if you can reasonably achieve the purpose by some other less intrusive means. It is not enough to argue that processing is necessary because you have chosen to operate your business in a particular way. The question is whether the processing is a necessary for the stated purpose, not whether it is a necessary part of your chosen method of pursuing that purpose. How do we decide which lawful basis applies? This depends on your specific purposes and the context of the processing. You should consider which lawful basis best fits the circumstances. You might consider that more than one basis applies, in which case you should identify and document all of them from the start. You must not adopt a one-size-fits-all approach. No one basis should be seen as always better, safer or more important than the others, and there is no hierarchy in the order of the list in the GDPR. What is your purpose – what are you trying to achieve? Can you reasonably achieve it in a different way? Do you have a choice over whether or not to process the data? Several of the lawful bases relate to a particular specified purpose – a legal obligation, a contract with the individual, protecting someone’s vital interests, or performing your public tasks. If you are processing for these purposes then the appropriate lawful basis may well be obvious, so it is helpful to consider these first. If you are a public authority and can demonstrate that the processing is to perform your tasks as set down in UK law, then you are able to use the public task basis. If not, you may still be able to consider consent or legitimate interests in some cases, depending on the nature of the processing and your relationship with the individual. There is no absolute ban on public authorities using consent or legitimate interests as their lawful basis, but the GDPR does restrict public authorities’ use of these two bases. The Data Protection Bill will define ‘public authority’ and the final text of those provisions may also have some impact here. We will publish more guidance on the effect of relevant Bill provisions when they are finalised. A university that wants to process personal data may consider a variety of lawful bases depending on what it wants to do with the data. Universities are likely to be classified as public authorities, so the public task basis is likely to apply to much of their processing, depending on the detail of their constitutions and legal powers. If the processing is separate from their tasks as a public authority, then the university may instead wish to consider whether consent or legitimate interests are appropriate in the particular circumstances, considering the factors set out below. For example, a University might rely on public task for processing personal data for teaching and research purposes; but a mixture of legitimate interests and consent for alumni relations and fundraising purposes. The university however needs to consider its basis carefully – it is the controller’s responsibility to be able to demonstrate which lawful basis applies to the particular processing purpose. Would individuals expect this processing to take place? What is your relationship with the individual? Are some of the individuals concerned likely to object? Are you able to stop the processing at any time on request? When should we decide on our lawful basis? You must determine your lawful basis before starting to process personal data. It’s important to get this right first time. If you find at a later date that your chosen basis was actually inappropriate, it will be difficult to simply swap to a different one. Even if a different basis could have applied from the start, retrospectively switching lawful basis is likely to be inherently unfair to the individual and lead to breaches of accountability and transparency requirements. A company decided to process on the basis of consent, and obtained consent from individuals. An individual subsequently decided to withdraw their consent to the processing of their data, as is their right. However, the company wanted to keep processing the data so decided to continue the processing on the basis of legitimate interests. Even if it could have originally relied on legitimate interests, the company cannot do so at a later date – it cannot switch basis when it realised that the original chosen basis was inappropriate (in this case, because it did not want to offer the individual genuine ongoing control). It should have made clear to the individual from the start that it was processing on the basis of legitimate interests. Leading the individual to believe they had a choice is inherently unfair if that choice will be irrelevant. The company must therefore stop processing when the individual withdraws consent. It is therefore important to thoroughly assess upfront which basis is appropriate and document this. It may be possible that more than one basis applies to the processing because you have more than one purpose, and if this is the case then you should make this clear from the start. If there is a genuine change in circumstances or you have a new and unanticipated purpose which means there is a good reason to review your lawful basis and make a change, you need to inform the individual and document the change. What happens if we have a new purpose? If your purposes change over time or you have a new purpose which you did not originally anticipate, you may not need a new lawful basis as long as your new purpose is compatible with the original purpose. However, the GDPR specifically says this does not apply to processing based on consent. Consent must always be specific and informed. You need to either get fresh consent which specifically covers the new purpose, or find a different basis for the new purpose. If you do get specific consent for the new purpose, you do not need to show it is compatible. whether there are appropriate safeguards – eg encryption or pseudonymisation. This list is not exhaustive and what you need to look at depends on the particular circumstances. As a general rule, if the new purpose is very different from the original purpose, would be unexpected, or would have an unjustified impact on the individual, it is unlikely to be compatible with your original purpose for collecting the data. You need to identify and document a new lawful basis to process the data for that new purpose. There is a link here to the ‘purpose limitation’ principle in Article 5, which states that “personal data shall be collected for specified, explicit and legitimate purposes and not further processed in a manner that is incompatible with those purposes”. Even if the processing for a new purpose is lawful, you will also need to consider whether it is fair and transparent, and give individuals information about the new purpose. How should we document our lawful basis? The principle of accountability requires you to be able to demonstrate that you are complying with the GDPR, and have appropriate policies and processes. This means that you need to be able to show that you have properly considered which lawful basis applies to each processing purpose and can justify your decision. You need therefore to keep a record of which basis you are relying on for each processing purpose, and a justification for why you believe it applies. There is no standard form for this, as long as you ensure that what you record is sufficient to demonstrate that a lawful basis applies. This will help you comply with accountability obligations, and will also help you when writing your privacy notices. Read the accountability section of this guide for more on this topic. There is also further guidance on documenting consent or legitimate interests assessments in the relevant pages of the guide. Read the ‘right to be informed’ section of this guide for more on the transparency requirements of the GDPR. If you are processing special category data, you need to identify both a lawful basis for processing and a special category condition for processing in compliance with Article 9. You should document both your lawful basis for processing and your special category condition so that you can demonstrate compliance and accountability. Further guidance can be found in the section on special category data. What about criminal offence data? If you are processing data about criminal convictions, criminal offences or related security measures, you need both a lawful basis for processing and a separate condition for processing this data in compliance with Article 10. You should document both your lawful basis for processing and your criminal offence data condition so that you can demonstrate compliance and accountability. Further guidance can be found in the section on criminal offence data.